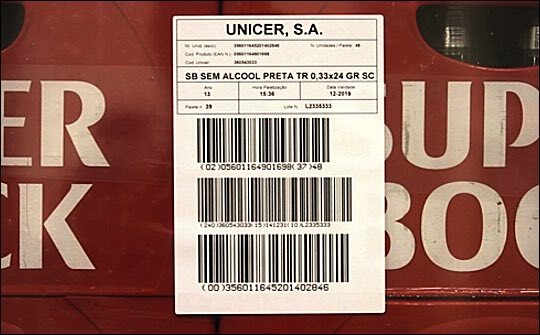 Unicer, part of the Carlsberg Group, is the producer of the world’s best-selling Portuguese beer, Super Bock, selling 220 million litres per annum in over 50 countries (see also news about Super Bock's new flavoured spirits launch and packaging design). Since 1927 Unicer has specialised in the production of drinks, including beer, sparkling water, still water, juices, soft drinks and wine. It has nine factories throughout Portugal. It’s commitment to the local communities in which it operates drives Unicer to adopt environmental sustainability in its production methods as far as possible. Compliance is a key objective and as a food and beverage manufacturer, it is legally required to print a bar code and batch number on every bottle and box, so it can track products, should quality issues arise. Recent investment in a number of Domino D620i laser coders for coding the neck labels on bottles and a number of D320i laser coders for shelf-ready packaging, provides Unicer with the agility to keep pace with changing coding requirements, to suit different bottle sizes and shapes and also to ensure coding is always legible. There’s the commercial imperative as well. If codes are poorly printed or barely legible, this can lead to the production line being halted, hitting sales and taking revenue off the bottom line. Unicer has been a long term adopter of Domino’s M-Series print & apply labelling systems, producing high resolution bar codes. More recently, Unicer installed a series of M-Series units to print then apply labels onto shrink-wrapped bottles. This high-speed solution blows labels onto the shrink wrap in the same place every time even at high production speeds. The integration of these systems is facilitated by Domino’s QuickDesign. With other production lines, it incorporates two new filling lines introduced to Unicer’s factories, integrating all of the Domino printers. This has improved Unicer’s capacity to respond and switch production lines with minimum downtimes, meeting market needs. By providing a solution that codes the bottle, the pack and the pallet – therefore covering primary, secondary and tertiary packaging – the cost to maintain and run the system is significantly lower than before. The new configuration was put to the test when Unicer devised The Cubo Project, a campaign to deepen its customer relationships, by offering prizes in return for a code printed on the bottle, which the customer had to enter into a website. Production lines produce 70,000 bottles per hour and each bottle is labelled in real-time. As each code is unique and relates to a corresponding database, coding needs to takes place at very high speed. To meet this challenge, Domino presented tested solutions, overcoming the issues in a timely way. The quality and reliability of Domino’s products was a deciding factor for Unicer with service levels singled out as a key factor in Unicer’s decision to extend its partnership with Domino, according to Amaral: “Our working relationship with Domino is very positive. The whole team are extremely competent and approachable and they make themselves available to answer our questions, which is greatly appreciated.